It was the last shift for the week and I was looking forward to go home and have a nice weekend. Need plenty of rest since I catch a cold last Thursday due to heavy rains when I was going to the office. I can hear the rain splashing in the windows of the 23rd floor where our department is located. It will be a nice sleep I said to myself, this rain will keep my room at a cold nice place to sleep. An hour before my shift ends, I received a YM message from my brother not to go home early after my shift because floodwater already entered our garage and the lower part of the apartment. 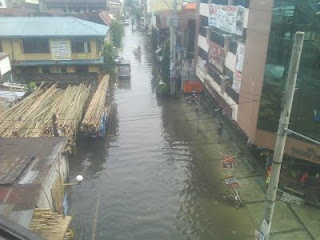 He already informed me that the main road (R. Magsaysay) is unpassable to vehicles. It was around 9am (4 hours after my shift) that I decided to go home. I am a little bit tired, some of my team mates are already gone home. Since I see the sun beautifully shining, I thought the flood would have receded by now since the rain already stopped almost 6 hours ago. Inside the LRT, I was stilll thinking if it was a good decision to go home. Upon leaving at V. Mapa station, I can see a traffic build up from Santol. That's when I realized I made a wrong move. The heavy traffic of vehicles not moving is up to Magsaysay bridge and afterwards I see what made the traffic stop. Ramon Magsaysay Blvd. was covered with leg high flood water. 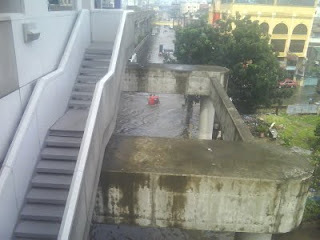 Only the brave vehicles dare to continue their quest to cross the road now also known as Magsaysay River. 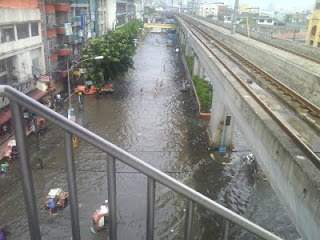 I was thinking that the side streets will be spared from the flood but I was wrong. No one was spared from the heavy downpour of rain earlier that dawn. Here are some pictures taken from my phone. With this situation I have seen, I will not be able to get home dry. I am not sure if the way home is dry, so I decided to head back 1 station and decided to stay at the red building famous for couples who want to spend time alone. I am not really used to go inside these places... ALONE. Bwahahaha! I wish! Maybe next time when I get stuck in a traffic or heavy rains I will make sure I have someone to accompany me there when the need to stay there arises. I will leave you with this video I have taken from Pureza LRT station.